Almost 50 years ago, streetcars in Washington, D.C. stopped running and most of their tracks were removed. Now they’re back and ready for a revival, with parts of the first two lines slated to open next spring. 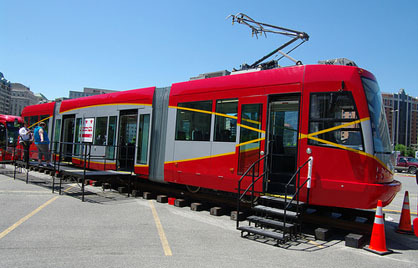 In this post, we talk to Dan Tangherlini, the former DDOT director under Mayor Anthony Williams, who committed to building one of the first two lines, about why streetcars matter for the nation’s capital. That’s the intro to a great piece on The City Fix, The Case for Streetcars, on D.C.’s new streetcar system and on why streetcars are so cool. His answers as to why investing in streetcars is more valuable than only focusing on buses or cars are spot on, from my experience studying this matter in-depth and attending regional and national streetcar conferences and workshops as well as broader national transportation conferences. Economic Development. Tangherlini says that one advantage streetcars have over buses is that the tracks “give a sense of permanence, and that encourages long-term investment.” Portland, Ore., which started operating North America’s first modern streetcar system in 2001, can attest to that. A 2008 studyby the city says that since streetcar plans were unveiled in 1997, “$3.5 billion has been invested within two blocks of the streetcar alignment.” The study lists “grocery stores, restaurants, galleries, shops and banks” as amenities that have been built near the streetcar lines. Of course, bus rapid transit (BRT) routes have also encouraged development in places like Curitiba, Brazil. But Tangherlini says BRT is most useful when you have stops separated by large distances, like on lines that bring commuters downtown from the suburbs. The goal of the streetcars, though, is to transport people between activity centers in the city. Tangherlini emphasizes that economic development isn’t merely a by-product of streetcar lines but, at least in D.C., part of the point of building the streetcar. He says when DDOT was planning the streetcar routes, it first mapped out current and future development, things like office buildings, shops and housing. The city is intentionally using streetcars to connect established activity centers, like Union Station, with emerging ones, like H Street in Northeast, which isn’t connected to a Metrorail line but is trying to sustain new businesses and attract more visitors. Transportation isn’t just for getting around, “it’s for making places for people to go,” says Tangherlini. Increased Capacity. The X1, X2, and X3 Metrobus lines, which run along H Street and Benning Road NE, are 34 percent over capacity, and many other bus routes have similar crowding issues (the District of Columbia Alternatives Analysis (DCAA) has a list of overcrowded routes). Tangherlini says adding streetcars can help alleviate overcrowding. He estimates that a typical Circulator bus holds 50-60 people, while the streetcars will hold around 100. More than 95 percent of Metrobuses hold between 26 and 78 people and less than 5% hold 100 passengers. It’s Not A Zero-Sum Game. “With each new level of transit, the assumption is that the older ones will disappear; that’s not true,” says Tangherlini. He says at public meetings, bus riders were wary of the streetcars because they thought bus service would disappear. But all along the plan was to have the streetcars and buses form an integrated network, with streetcars at the network core and Circulator and Metrobus lines radiating out from there. That’s one reason that the Circulator buses and the streetcars are both painted bright red; they form a continuous network. Buses that already run on proposed streetcar corridors will keep running, too. And in some cases bus service on those corridors will even increase. Metro recently announced, for example, that they added another bus route, the X9, to H Street and Benning Road. The streetcar will simply be one more transit option along these corridors. You Know Where It’s Going. “Rails have a good psychological effect,” says Tangherlini, “because you know where it’s going.” And, according to a 2003 WMATA survey of non-bus riders, this is a big deal: 30 percent of the survey respondents said that “better information about the services offered” was one of the most important improvements WMATA could make to its bus service. It’s likely that anyone who’s been on a bus that took an unexpected turn would agree.